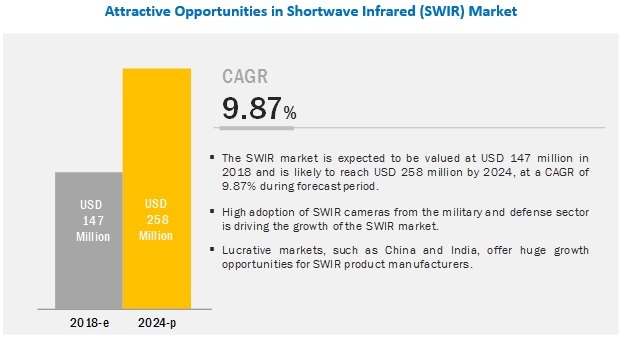 [172 Pages Report] The shortwave infrared (SWIR) market is expected to be valued at USD 147 million in 2018 and is likely to reach USD 258 million by 2024, at a CAGR of 9.87% during the forecast period. High demand for SWIR products from the nonindustrial vertical is one of the major factors driving the growth of the market. Moreover, SWIR cameras are increasingly being used in various industries such as electronics and semiconductors, food & beverages, and aerospace for machine vision application; this factor is also expected to considerably boost the growth of the said market in the coming years. In this report, the SWIR market, by technology, has been segmented into cooled and uncooled. Among the two, uncooled segment is expected to hold a larger share of the market throughout the forecast period. The dominant position of this segment can be attributed to the high demand for uncooled SWIR cameras owing to their low cost compared with cooled SWIR cameras. Security & surveillance is the major application area for which uncooled SWIR cameras are used in the SWIR market. The market for line scan SWIR products is expected to witness significant growth during the forecast period. The major applications of line scan cameras are in the industrial vertical. SWIR cameras are well suited for applications requiring imaging of fast-moving objects, and their cost is lower than that of area scan cameras, thereby leading to their wide adoption in the industrial vertical. A number of companies in the SWIR market offer line scan SWIR cameras. For example, Xenics (Belgium), under its Lynx line scan camera product range, offers various linear SWIR cameras that are available in 3 line resolutions of 512, 1,024, and 2,048 pixels. The company also offers Xlin-1.7-3000, which is a high-speed 3,000-pixel SWIR line scan InGaAs detector. North America is expected to account for the largest share of SWIR market during the forecast period. The market in this region is also expected to witness significant growth during 2018–2024. One of the major reasons for the leading position of North America is the presence of several prominent military and defense, scientific research, and medical players in this region that are generating demand for SWIR cameras. 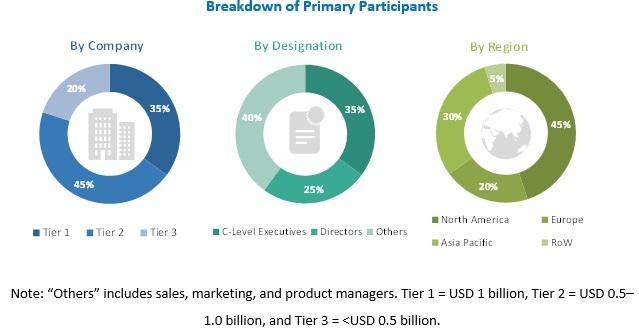 Key players in the SWIR market include Sensors Unlimited (US), FLIR Systems (US), Xenics (Belgium), New Imaging Technologies (France), Allied Vision Technologies (Germany), Sofradir (France), Raptor Photonics (UK), Hamamatsu Photonics K.K. (Japan), and Opgal Optronic Industries (Israel). Sensors Unlimited is well known for its SWIR imaging solutions and InGaAs technology products. Its leading position in the SWIR market can be attributed to its strong product portfolio of SWIR cameras, consisting of both area scan cameras and line scan cameras. The company is further strengthening its product portfolio by introducing new products. In 2016, the company launched Micro-SWIR 640CSX Camera—a rugged, lightweight, and low-cost SWIR camera; and in 2015, the company introduced two new SWIR products—320-MicroSWIR camera and GL2048R camera. Besides extensive product portfolio, the company’s strong brand image and wide geographic reach have also helped it attain a leading position in the SWIR market. In April 2018, Allied Vision Technologies (Germany) expanded its Goldeye camera family with the launch of 2 new InGaAs camera models for short-wave infrared—Goldeye G/CL-033 TECless and Goldeye G/CL-008 Cool TEC1. Goldeye G/CL-033 TECless is ideal for applications with temperature-stable environments, while Goldeye G/CL-008 Cool TEC1 is suitable for applications having high temperature fluctuations. In March 2018, New Imaging Technologies (France) expanded its SWIR camera product portfolio with the launch of WiDy SenS, a new SWIR camera. This product can efficiently deal with fast variations of illumination conditions making it ideal for applications such as surveillance, microscopy, and laser beam profiling. In November 2017, Sofradir (France) entered into a distribution partnership with ATD Electronique (France) to extend the European customer base for its SWIR detectors based on infrared InGaAs technology. What are the emerging applications of SWIR cameras? How are advancements in industrial and nonindustrial verticals influencing the SWIR market? Which scanning type SWIR camera is expected to penetrate significantly in the SWIR market? The study involved 4 major activities to estimate the current market size for shortwave infrared (SWIR) products. Exhaustive secondary research was done to collect information on the market and its peer and parent markets. The next step was to validate these findings, assumptions, and sizing with industry experts across value chain through primary research. Both top-down and bottom-up approaches were employed to estimate the complete market size. Thereafter, market breakdown and data triangulation were employed to estimate the market size of segments and subsegments. In the secondary research process, various secondary sources have been referred to for identifying and collecting information important for this study. These secondary sources include infrared imaging journals and magazines, IEEE journals; annual reports, press releases, and investor presentations of companies; white papers; certified publications and articles from recognized authors; and directories and databases such as Factiva, Hoovers, and OneSource. In the primary research process, various primary sources from both supply and demand sides have been interviewed to obtain qualitative and quantitative information important for this report. The primary sources from the supply side included industry experts such as CEOs, VPs, marketing directors, technology and innovation directors, and related executives from key companies and organizations operating in the SWIR market. After complete market engineering (including calculations regarding market statistics, market breakdown, market size estimations, market forecasting, and data triangulation), extensive primary research was conducted to gather information as well as verify and validate the critical numbers arrived at. In the complete market engineering process, both top-down and bottom-up approaches have been implemented, along with several data triangulation methods, to estimate and validate the size of the SWIR market and other dependent submarkets listed in this report. After arriving at the overall market size from the estimation process explained above, the overall market has been split into several segments and subsegments. To complete the overall market engineering process and arrive at the exact statistics for all segments and subsegments, market breakdown and data triangulation procedures have been employed, wherever applicable. The data have been triangulated by studying various factors and trends identified from both demand and supply sides in industrial and nonindustrial verticals. Sensors Unlimited (US), FLIR Systems (US), Xenics (Belgium), New Imaging Technologies (France), and Allied Vision Technologies (Germany), among others (total 20 players are covered). This research report categorizes the SWIR market based on technology, scanning type, application, vertical, and region.